Trude grew up in Bratislava, then capital of Czechoslovakia. Aged 9, she escaped the country by train with her aunt and cousin and arrived in England. 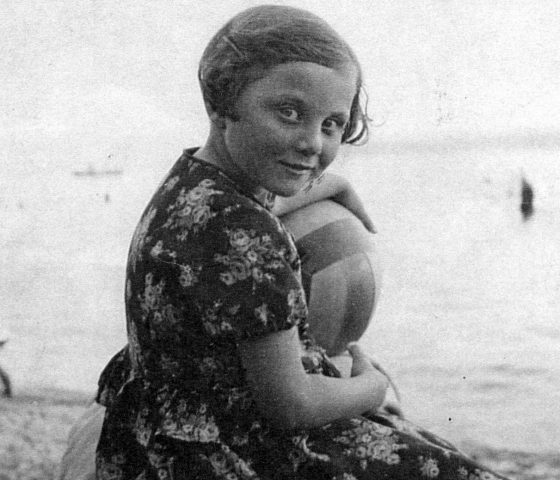 Trude was born Gertrude Feldmann, the youngest of three children in a happy middle-class family in Bratislava. Trude’s birth in 1929 coincided with the Wall Street Crash, which led to the collapse of her father’s bank and affected the family income. Nevertheless Trude has happy memories of her early life, with walks in the hills in summer, skating and tobogganing in the winter, ballet lessons, and three different languages spoken at home. Treats and holidays were provided by her extended family of uncles and aunts, who proved instrumental in helping Trude and her siblings survive the Holocaust. While Trude attended a Jewish school, her family was not particularly observant and she doesn’t recall experiencing anti-Semitism as a child. Trude has limited memories of Hitler’s rise to power in Germany, though she vividly remembers hearing him “shouting his speeches” down the radio, and hearing reports of her father’s sisters in Austria being ill treated and brutalised by the Nazis. In March of 1938, when things became particularly tense due to the Anschluss (Germany’s annexation of Austria), Trude’s father sent the family to stay with his mother in the relative safety of the countryside. The same happened again in October of that year when British prime minister Chamberlain went to see Hitler to discuss the cessation of the Sudetenland to Germany. For the Feldmann family the writing was clearly on the wall, and Trude realised that her parents were doing their utmost to get their three children out of Czechoslovakia to safety. Trude’s sister was the first to leave on 31 December 1938. She was taken in by an English family near Kew Gardens in London and lived happily with them until her marriage. Their older brother Paul found a job at a furrier’s in London and travelled there in May 1939. Trude recalls the sense of escalating danger. She remembers looking out of her classroom window in March 1939, when the Germans invaded Slovakia, and seeing tanks in the street. Trude has a limited memory of the trauma of leaving home. Her aunt had managed to get permission to work in England as a domestic servant and took her own daughter and Trude with her. They left one morning, bundled in a taxi, and suffered a 4-day journey by train, stopped numerous times by officials. Eventually they took a boat from Flushing to Harwich, followed by another train, and finally arrived at Liverpool Street station at midnight. Trude was terribly homesick during her first months in England. The unfamiliar food and cold, draughty houses were completely alien to a nine-year-old child who spoke no English and had just seen her family broken apart. She pays tribute to the kindness and generosity of foster families who she stayed with and who did their best to help a traumatised little girl. Trude was then evacuated to Rickmansworth and subsequently Cornwall where she spent the duration of the war. She remained close to her brother and sister through letters and occasional visits. The three of them shared the rare Red Cross letters that their parents were able to send, and which could take six or seven months to reach them. Trude loved learning and had a passion for science. She moved to Leeds to study at Leeds University where she met her husband, Norman and built a happy family life with their two children. Her brother and sister both married and settled in England. Trude did not give up on the search to find out what happened to her parents. She discovered that her father died in Auschwitz. However, many decades after she left Bratislava as a child, Trude is still searching for information on what happened to her mother. Trude still lives in Leeds, where she is an active member of numerous voluntary organisations including HSFA. She regularly speaks about her experiences as a child moving to England and spreads a message of tolerance and hope.